The preparation of Compositor 4 master version took all spring, summer and also the part of autumn of 2017. The last changes touch the creation of loops library taken from MDL12 non-duplex modem, which you may load in 8 decks of Compositor 4 for simultaneous playback. 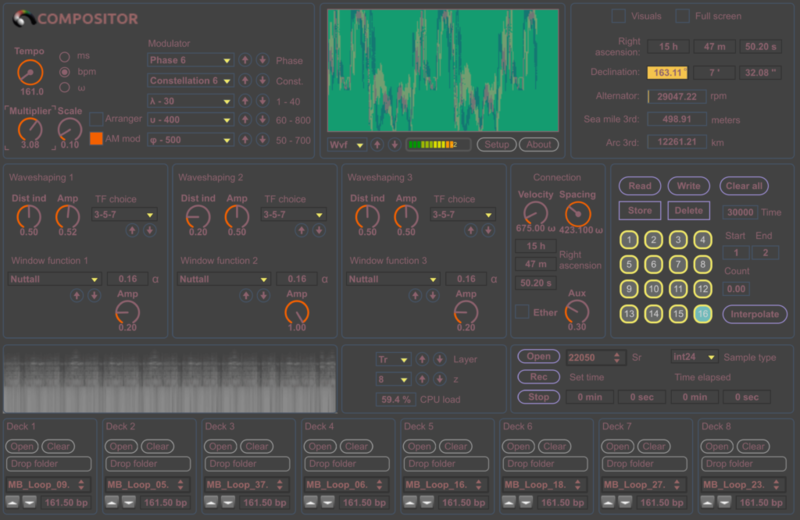 These profiles give you a unique chance to obtain 42 devices based on wavetables. Changing the tuning of z parameter you are also switching between 7 Compositor RT-zX devices, which may work in automatic mode using the arranger and in manual mode. It gives you a sum of 56 devices for the price of one in standalone version of the software. Using z parameter you can change internal architecture of the software in fraction of a second, which allows to make perfect preset interpolations. In Compositor 4 you are purchasing the universal instrument for loops bouncing, which may be a complete track and as a part of your music set. All decks work synchronous to Compositor 4 internal generators tempo and are indispensable parts of software. You can create a channel matrix of 8×42 and use the carriers of physical modeling in unison to loops playback. The sum of Compositor 4 signal processed using master MS-decoder and stereo image enhancer, which improve spatial characteristics of you phonogram. It is worth mentioning about master bus tube, which warms the signal and enhances it with harmonics. 6 master tube harmonic sets allow to change tube type in master channel cascade using one mouse click. An ability to load your own loops in decks makes this instrument a unique groovebox with unrivaled characteristics. The modulator and main parameters section is also worth a price, because you can change the phonogram tempo from 0.05 bpm to 5760 bpm without a loss in synchronicity of the playback. The Multicolor display allows remembering program tunings using the color and set up in relation to tempo and program multiplier. The large amounts of algorithm combinations, 56 device profiles, two types of internal synthesis and master procesing make Compositor 4 indispensable studio instrument.